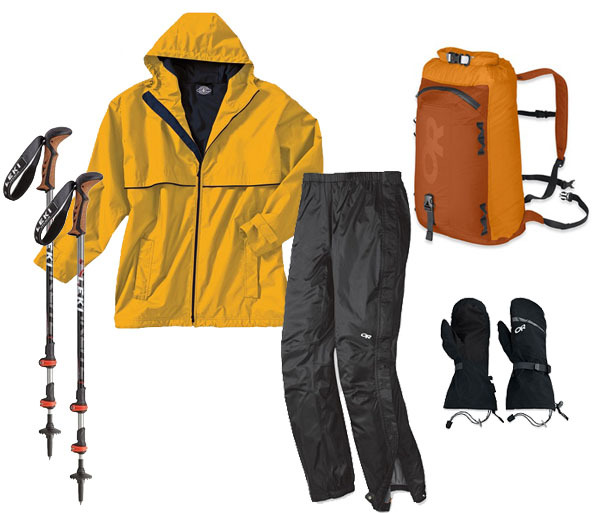 Rent this complete set of essential gear for your Oceanwide Antarctica expedition and have it delivered to you in Ushuaia. The display rental price is based on a 10 day voyage - your price will vary depending on the length of your voyage. In the "Comments" field found during check-out, please indicate your arrival date in Ushuaia and name and dates of your pre-stay hotel. There is no security deposit charged for our rental gear. Please understand, failure to return the gear, will of result in a gear replacement charge made to the same credit card you used to place your order. Thank you. The Ultralite Waterproof Pack made by Outdoor Research. It's an ultralight, weatherproof bag that weighs a mere 9 ounces and absolutely protects gear from 'the wet'! The Ultralite Trekking Staff made by LEKI™. It's made of their strongest, lightest weight aluminum, and is specially constructed for a world traveler and trekker. May it help make all your outdoor sojourns more enjoyable and easier to negotiate. Waterproof pants made by Outdoor Research. These waterproof pants are fully seam taped, - no moisture gets through protecting you from the "wildest winds", the "drenchiest downpours", and the "soggiest salt spray". GORETEX waterproof mitten shells made by Outdoor Research. They are the ideal "wear them over all your other insulating handwear to keep you warm and dry". The ideal outer layer to "protect your digits" for cold winter weather excursions.